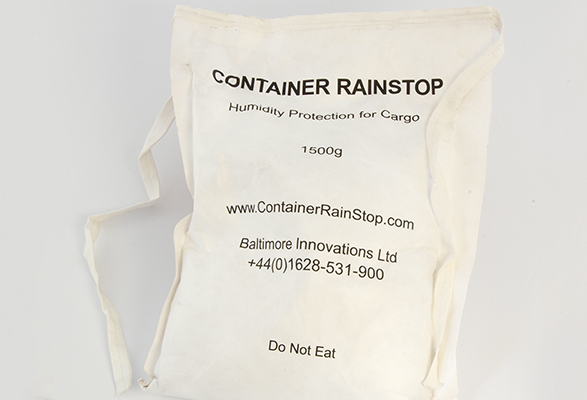 ContainerRainStop™ is a blended desiccant bag for cargo protection, especially formulated for use in steel shipping-containers. Above all, it protects cargo from moisture damage while it is in transit. Therefore, it prevents tin cans from going rusting and garments and cardboards from fungus growth. Also, it stops water-soluble labels from peeling-off. We can provide these bags in 500 gram size for easy placement throughout shipping containers and also 1500 gram bags with tie strings, for customers who prefer to hang the product from container hooks. Proven …because we already supply many shipping companies. For help with your Cargo Protection requirements or any other problems that you have, please give us a call on +44 (0)1628 531900.